Happy World Chocolate Day!!! In anticipation of this glorious event, we took a tour last week of Nestlé’s chocolate factory in the heart of the Junction. I love the Junction. I recently took a food tour of the area and it’s astonishing that such a big operation is tucked away in the neighbourhood! But with big shiny neighbours like the new Drake Commissary, it’s not that surprising. People must love coming to work everyday. Almost time to #UnwrapSomeGood, but safety first. We arrived at the factory, had a little chat and got into our safety gear. This included a hairnet, hardhat, steel-toe shoes, earplugs, lab coats, plastic science experiment goggles and a beard hairnet for my main man & photographer, Chris Bull. Woah! We also went through a whole washing and dusting process before entering the factory areas, since the whole facility is strictly peanut free. Something that not everyone may know of is Nestlé’s Cocoa Plan. With so many leading brands (Kit Kat, Aero, Smarties, Coffee Crisp, and Turtles, Rolo, After Eight, Quality Street) and success under their belt, there’s been no better time for Nestlé give back to the regions that allow Canadians everywhere to enjoy chocolate. Where to start? The cocoa that Nestlé uses is sourced from Cote d’Ivoire – an area that is already responsible for 40% of the world’s cocoa production. How to give back? To help form a holistic approach, Nestlé’s worked with The International Cocoa Initiative, Fair Labour Association, UTZ, and World Cocoa Foundation to develop the Nestlé Cocoa Plan. The Cocoa Plan helps train farmers, which leads to better, higher-yielding crops, which leads to more product for them to sell and better product for everyone to eat. All the while, helping on a community level by supporting women’s mico-businesses and improving access to education for children in these farming communities. 42 schools have been built! Nestles work in the region touches over 40,000 farmers. That is huge, and the project is not close to finished. The tour was amazing! We saw naked Smarties! We saw a control board that looked like it could have been from NASA. 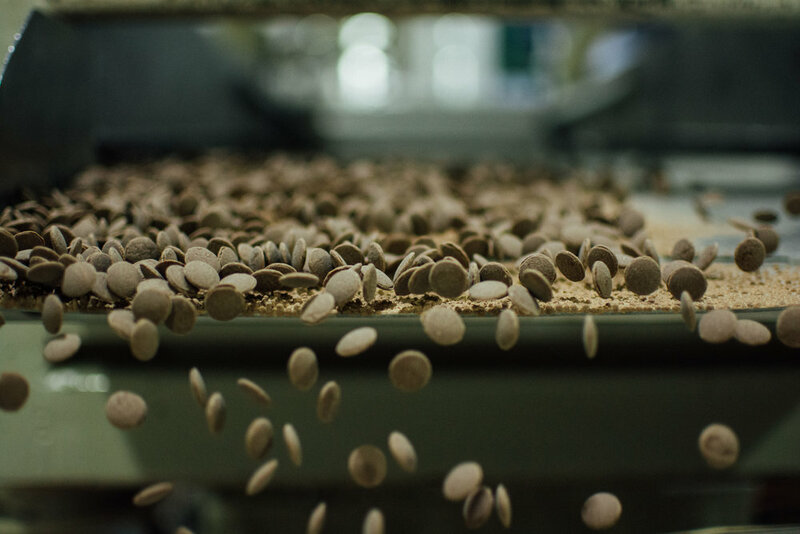 We saw how even though a lot of processes are automated these days, there are certain jobs that just can’t be replaced – like a quality control patrol that picks out Coffee Crisp wafers that can use more help getting an even chocolate coat. And it was very fun talking to the workers themselves. Turns out, they still don’t get sick of chocolate! Here’s a fact that astonished me- nowadays, 95% of Canadian Households have a Nestlé product in there somewhere. That’s a big impact and a big opportunity. The fact that Nestlé can now say their chocolate is 100% sustainable with natural flavours, no artificial colours, and is totally prepared in Canada while doing their part overseas- that sounds like a win for everyone.